Cupcakes 'n Daisies: Some Old and Some New . . .
my daughter made this snowman picture . . .
and this one, she did such a nice job it looks like a painting, not needlework. I wasn't even making quilts when Ashley stitched all the quilt patterns. I went through a Victorian House phase. There's more, but I'll spare you the pictures!! Ashley and I also have holiday pictures and we've given several projects to family. I quit cross stitch because there's only so much wall space available for these things but I still miss doing handwork in the evenings while watching TV with my husband. Lately I've been inspired by the different embroidery projects I've seen on some folks blogs. It really got me thinking about trying embroidery. Once upon a time I did embroidery, but I was rarely satisfied with my work. Then I discovered counted cross stitch and knew I had found my handwork calling.....those neat, perfect, precise x's suited me to a "t"!! So when I saw this embroidery project I thought perfect, some hand work for me to enjoy at night, and something that I don't have to find an empty space for on the wall or have framed. It's Hocuspocusville, by Crab Apple Hill. It's part quilting and part embroidery. So this is what a pattern looks like. This is to be traced on to material, then stitched. I picked number two because I thought it looked easier than number one. And here's my stitches, this is my 3rd try. This is why I gave up embroidery, this just isn't my medium. I loved making the stitches they just don't look as good as I would like. I'm done. Working on this project reminded me how much I enjoy needlework, but not Hocuspocusville. So I'll be looking for something else, what I just don't know yet!! While I was piddling with the embroidery I cleaned out my needlework tub. I'm planning a giveaway for Wednesday, March 31st, 6 am central time. 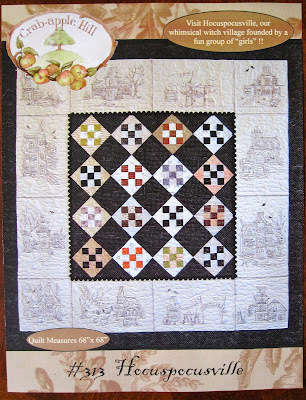 I have a few kits and patterns that could use a new home so check them out. The first person to leave a comment for an item owns it. I'll mail it to you, wherever you are!! So come back Wednesday if you're interested, I plan to give away that Hocuspocusville pattern too. The cross stitch looks wonderful! There are many hours in those pieces. Like you, I find it very enjoyable. Soothing even as I have to concentrate and it clears my mind of other things. I bet you will find it a good home though! I agree with you I think we all find out mediums and style and thats where we are most comfortable. I used to do cross-stitch almost constantly too . . . but now it's English Paper Piecing . . . I bet you would like it because everything is so precise just like when doing c/s . . . I recently started Sashiko too . . . and I am really liking that as well . . . I actually have all those quilt c/s patterns . . . only make one though . . .
Oh your cross stitch is just amazing! I used to cross stitch a lot, but you're right there are just so many hours in the day, and so much wall space. But I do love it! Hi Thelma- your cross stitches are wonderful! I don't like my embroideries either but they are fun, so I still do them! You are so inspiring! Okay my jaw is on the floor. Those are exquisite. Really. I'm speechless. I want to go hide the few attempts at cross stitch under a rock in comparison. I'll have to check early on Wednesday. I did cross stitch in a former life, too. Your pieces are just wonderful. Sorry the Hocuspocusville stitching didn't work out. I have several Crabapple Hill patterns I want to make into quilts, but whether they will ever get done is anyone's guess! you are too funny. I use to cross stitch too. I have been thinking of starting embroidery too, but maybe something real simple until my stitches improve. I use to embroider when I was 10, but can't remember how now. maybe you just need to start on a smaller not so daunting pattern. look forward to your giveaway on Wed. I'm going to send an e-mail about your Hocuspocusville pattern. Get ready! Lovely cross stitch. I used to do a lot of cross stitch too. The quilt pictures are so gorgeous. The Xstitch projects are awesome. I love hand embroidery. Used to do counted xstitch years ago. But it got to hard to see the linen and I gave it up. It seems a lot of us quilters used to be cross stitchers!! Your work is gorgeous. I really like those Victorian houses. Sorry you didn't enjoy the Hocuspocusville. gor-gee-ous cross-stitch ... i bought the patterns for those victorian houses ... i think they are still in the basement somewhere - probably with the linen and floss, just waiting for me to donate them - ha ha ha! it takes a mighty strong person to tell herself that it just isn't working ... and, even though i am loving working on Hocuspocusville - it gets on my nerves sometimes, too ... it's just so very, very ... squiggly ... innit? i think that your embroidery stitches are nicely done, but if YOU don't think so ... you're the boss of you! All of those stitcheries are beautiful!! And it looked like the Hocus Pocus was great also. But I know if you're not feeling it, then it's not going to happen. 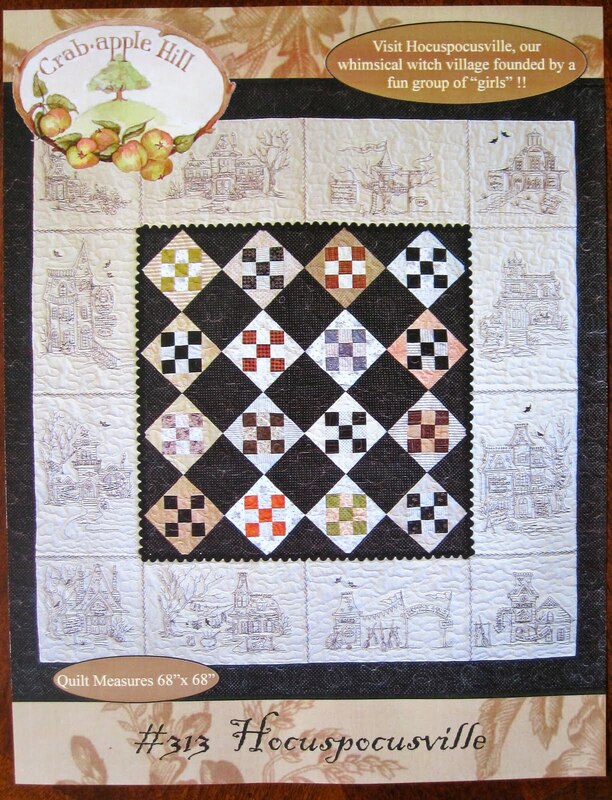 You did choose a good pattern from Crabapple Hill...maybe you could give it another chance! I think the "wrapped" or "whipped" back-stitch makes all the difference in the stitching...it covers up any little skipped spaces or flaws in your stitching. I would be glad to teach you so you could give it another try. Let me know. For me, I stitch every night. Now that the eyes are older and don't like the counted x-stitch anymore, I can wrap-back-stitch for hours! Oh, and I will definately be back tomorrow a.m. I love cross stitch also but have found a wonderful way to keep working on projects despite lacking wall space...christmas ornaments! I love Mill Hill kits...especially the yearly santa designs by Sandy Cozzolino...check them out! There is also a series of Christmas village ornaments (Victorian style!). These ornaments are done on perforated paper but I have seen them done on linen and stitched into a hanging ornament(little pillow). Absolutley adorable. I get at least 2 dozen of these little projects done a year...pretty soon I will have my 9ft tree full of handmade ornaments. I had the opposite experience. I enjoyed embroidery but HATED cross stitch (did 2 projects). but why can't you find cross stitch designs that could be used in quilt blocks. that would look great. I think your embroidery looks fine in the picture! Its not going to look as perfect as the x's in a counted piece, but it is still beautiful! Thelma, I have cross-stitched some of the same quilt pictures as your daughter did and have them hanging in my home! Love them! Your embroidery is looking great! I have the Polka Dot Girls embroidery I am hoping to start later this year! What a fun idea for a giveaway! Your blog is always so great to visit. I loved seeing all the beautiful cross stitching you and your daughter have done. My mother loved to cross stitch, and my sisters and I have quite a few of her pieces. I'm sure Hocuspocusville would have eventually been fabulous, as is everything you tackle, but I think you're smart to pass it along if you're just not feelin' it. I was a cross stitch addict before I was a quilter and I know what you mean about the wall space! I still stitch from time to time and have just as big of a cross stitch stash as a quilting stash. Sigh. Yours and your daughter's work is stunning. It's funny, I have some of those same patterns with the quilts (Paula Vaughn I believe) and I also bought all of them long before I had even considered quilting. Bummer that the embroidery didn't work out. I still get my handwork fix either through cross stitch or the stitching down of the binding on a quilt.